Is you belly rapidly expanding with your little one growing inside? Why not try one of our roll-on balms to help soften and soothe your belly? 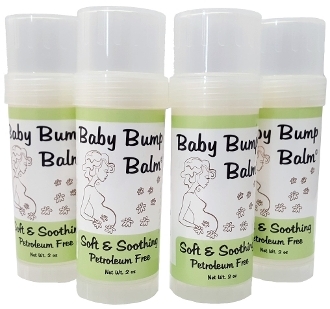 Our Baby Bump Balms are made with: Coconut Oil, Beeswax, Shea Butter, Sunflower Oil, Sweet Almond Oil, Aloe Vera Oil, Tea Tree Essential Oil, Lavender Essential Oil, Chamomile Essential Oil and Vitamin E Oil. There are 2 oz of goodness in each balm.